Has any Survivor contestant’s paranoia ever manifested in as entertaining a fashion as Tony’s? This guy is paranoid as hell in a way that is borderline obnoxious at times, but you can’t deny that it’s getting him results. As an added bonus, it’s creating some darn fine episodes of Survivor in the process. What’s incredible is that many people playing the game fully recognize Tony’s paranoia, his scrambling gameplay—and yet it is still working for him as part of his strategy. He blatantly airs all this paranoia as soon as they get back from last week’s Tribal Council, when he immediately freaks out about people in the other (minority) alliance writing his name down. First of all, why does this matter? They are not in your very powerful alliance. Second, who is playing the game harder than you, Tony? His entire rant just reeked of panic and desperation, and everyone—both people in his alliance and his enemies—noticed. And yet it didn’t matter. Tony immediately turned his paranoia into a plan to deflect some of the spotlight from him to LJ, and the damn plan worked! Tony is a proven liar to his fellow tribemates, he shows recognizable signs of playing too hard and panicking, and yet he is easily able to pull off a fairly stealthy move to concoct an elaborate lie to get LJ out without LJ ever having a clue it was happening. The reason I think it worked is that despite Tony’s paranoia, despite his panic and tendency to play to hard, he has a pretty good idea of how to maneuver within his alliance. He knows that making up a lie that LJ wants to turn on Woo is a fairly reliable way to get Woo solidly on his side, as Woo (as fun as he is) isn’t necessarily a deep strategic thinker. Once Tony decided to go down this route, Woo was really the only person from his alliance he even had to get on his side; the rest of it hinged upon getting the three members of the minority alliance to join his side, and why wouldn’t they vote his way, sparing themselves another week? 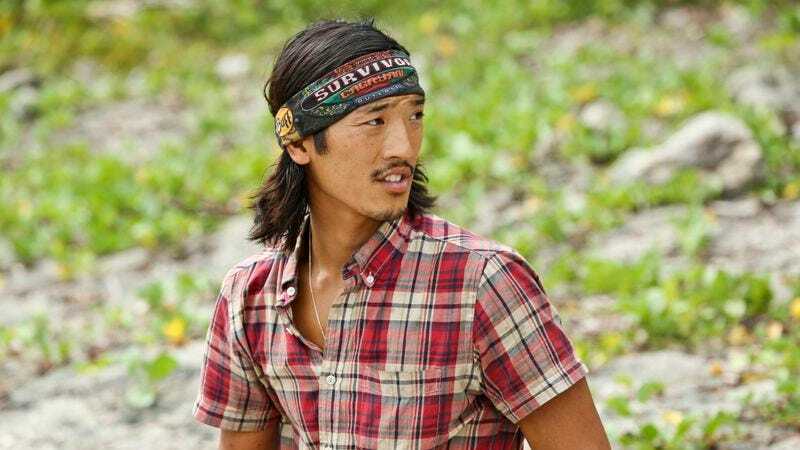 With Tony’s alliance still following the “split the votes to flush an idol” scenario, Tony only needed Woo, and by making up a lie that threatened Woo’s place in the game, Tony easily got him. The interesting part of the whole situation was how easily Tony was able to keep this from getting back to LJ and shaking his confidence (and Jefra too, I guess, but she’s so invisible in this game she barely matters at this point). LJ repeatedly recognizes Tony’s paranoia throughout the episode but at no point seems worried that this paranoia will come back on him. LJ feels completely secure in his alliance, which has to be a testament to how well Tony is doing in this game socially despite his frequent attacks of paranoia. Even Trish, who knows Tony is capable of this, who Tony tells straight out that he plans on getting rid of LJ, doesn’t go back to LJ and impart the news, or even seem to warn him. The dynamics of exactly how this alliance works are fascinating, especially when presented with an episode like this that should blow those dynamics up somehow. But the best part of the episode was that even though it was really easy to see the LJ vote coming, it was still very fun and satisfying. The entire episode was peppered with extremely optimistic confessionals from LJ and Jefra exclaiming their alliance’s loyalty and strength, so much so that it was obvious this was being set up for a big fall. This was cemented at Tribal Council, when Jeff started hammering poor, clueless LJ on his perception of his alliance’s loyalty, so much so that his ousting became basically inevitable. Where last week’s predictable episode managed to be entertaining because of the fun idol hunt, this mostly predictable episode was fun because all of the scheming leading up to the vote was the stuff of classic Survivor. I have no idea why Tony was so set on getting out an ally right now—it seems like he’s showing his hand pretty darn early—but who cares, when it was so fun to watch? There has been a lot of talk calling Tony a likeable Russell Hantz, and it’s easy to see that comparison when he pulls off moves like he did here. Whether or not he can keep doing these things now that people are on to his game, that is yet to be seen, but I can almost guarantee it will be entertaining to watch unfold. Is Tony a construction worker or cop, according to what everyone else knows? Make up your damn mind and tell one story, dude. I like Trish a lot as a player, and her position on what went down this week is the one I’m more interested in. She obviously didn’t vote for LJ but she didn’t tip him off, either. Interesting. The reward challenge was fun, but that immunity challenge was a snore. No one wants to watch people pick colored tiles out of a box, show. What was actually up with Tony’s “bag of tricks?” Was that just his stuff he had packed?